There were victories, of sorts, all round last night. 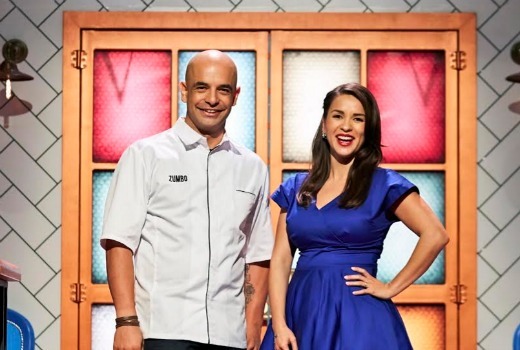 Zumbo’s Just Desserts nabbed a timeslot win with 880,000 viewers -its best result since its premiere episode, and enough to beat The Block. But Nine edged in front with Married at First Sight pipping 800 Words, also topping the Demos last night. Australian Survivor improved on its Monday outing, closing the gap with The Block and attracting high praise on social media. Seven News and ACA both won their respective timeslots while The Chase is back in front of Hot Seat once more. Seven network won Tuesday with 29.8% then Nine 25.8%, TEN 20.35, ABC 17.1% and SBS 7.0%. Seven News was #1 with 1.19m / 1.1m for Seven then Zumbo’s Just Desserts (880,000), Home and Away (801,000), 800 Words (742,000), The Chase (715,000 / 468,000) and Winners and Losers (411,000). Nine News (999,000 / 976,000) was best for Nine then A Current Affair (840,000), Married at First Sight (810,000), The Block (792,000), Hot Seat (539,000) and King’s Cross ER (347,000). Australian Survivor (728,000) led for TEN followed by The Project (718,000 / 452,000). TEN Eyewitness News was 493,000, NCIS was 296,000 and NCIS: LA was 245,000. ABC News (756,000), 7:30 (662,000), City in the Sky (571,000), Catalyst (552,000) and Foreign Correspondent (453,000) comprised ABC’s night. Pointless was 261,000. On SBS it was Royals Who Rescued the Monarchy (393,000), Insight (266,000), Dateline (150,000) and SBS World News 144,000. 7mate’s Highway Patrol was best on multichannels with 260,000. OzTAM Overnights: Tuesday 30 August 2016. I was one of those watching SBS…well most of the night…did not care for Crimes of Passion replacement…..but the rest of the night was good….. Sadly winners and losers is limping to the finish line. Another meh episode. Free to air is disappointing at the moment. There is very little to watch. At least the library has been a good source of entertainment of late. Currently watching season 1 of supergirl and a few weeks ago watched Nashville season 3. I find this argument a bit tired. This year, with 7flix/9Life/SBS Food there are three new FTA channels. Plus the streaming platforms are showing more content. SBS has online only series like Trapped. ABC last night had a great doco in City in the Sky. At least this year, everywhere you turn doesn’t have TBBT repeats. Everywhere you turn may not have tbbt repeats but there is truckloads of reality and movie reruns. More channels doesn’t necessarily translate into content of interest. That Survivor Ep was amazing!!!!!!!!!! Yes it was. And the good thing is that the implications of the tribal decision should make for great TV going forwards! Agreed! What a brilliant tribal! And the production values are shmick! Finally, the sour taste of Celebrity Survivor has been washed away for good. God I checked that Zumbo show out in ad breaks and man that is so bloody bad it’s laughable! Same. I cannot sit through more than a few minutes. I’m amazed that it beat The Block last night. Perhaps the Willy Wonka top hat dessert did it for them? Seven’s tacky promos no doubt helped Zumbo. I am amazed it has beaten The Block twice now. And TEN surely breathing a sigh of relief that Survivor lifted (and seems to be doing relatively well in the demos). I just remembering the other day that Survivor has started exactly like The Bachelor – early in the week and doing 600-700k (nothing too great at the time), but now look at it. I agree that keeping it off Sunday is better for the show — theres just nothing else they have to play instead. Still running with 7.30 can’t help. Fantastic episode of Survivor last night – that final Tribal Council twist was a real game changer! Really enjoying it. Watched ZJD last night, but was on a phone call when they did the Willy Wonka dessert challenge. Was it explained how they were able to float the dessert dish? I missed a lot of that segment, unfortunately. I didn’t watch it, but I’ve seen the promos. Would’ve been a usage of magnets or liquid nitrogen. I was forced to watch it last night as I was at someone else’s house. I wasn’t paying atention to most of it, but I did hear the explanation of the floating thing. Basically it was magnets repelling each other which created the floating platform. Gee, none of the extra viewers who watched hot seat on Monday night stuck around. Seriously if you’re not watching Survivor you’re missing out. I agree. I still contend that the more viewers get to know the survivors, the more loyal they eill become. Last night’s tribal was fantastic. I hope producers have more of these little twists on the US version – keeps us hooked! Interestingly Survivor beat the Block and Zumbo in 2/3 demos and 2nd in the oldest demo. Look as though all 3 shows are doing OK, but nothing stellar.